This quilt is now available for sale in my shop! Do you have a quilting bucket list? I do, but it's getting really short. I have basically had the same few quilts on my list since I very first started quilting and I have been slowly checking them off. 4. Farmer's Wife (started but never finished, maybe someday?). The posts are here, here, here, here, and here. Other than the Farmer's Wife - which I am not sure if I will ever finish - this quilt completes my list. To be honest, this one has kind of scared me. It can be made with appliqué or it can be pieced, it involves paper piecing and sewing curves, and it was just a little intimidating. 2. leave the foundation paper piecing papers on while you sew the big outer curve, but remove them before you sew the small inner curve. It made things MUCH easier. I really enjoyed sewing with the Wildside fabrics for this quilt. They were in the December Culcita Box and they are the perfect amount of "wild" for this pattern. 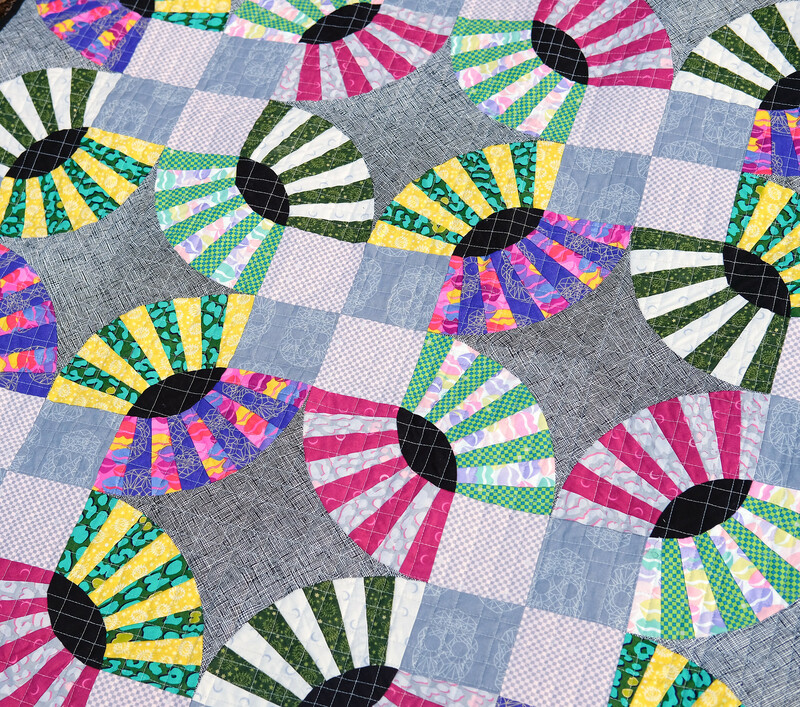 The backing fabric is also by Libs Elliott, from her True Love collection, and I love how it tones down the craziness of the quilt top but still has lots of personality. For the quilting, I did an grid of straight-ish, randomly spaced lines. I quilted them pretty close together to give the quilt lots of texture. 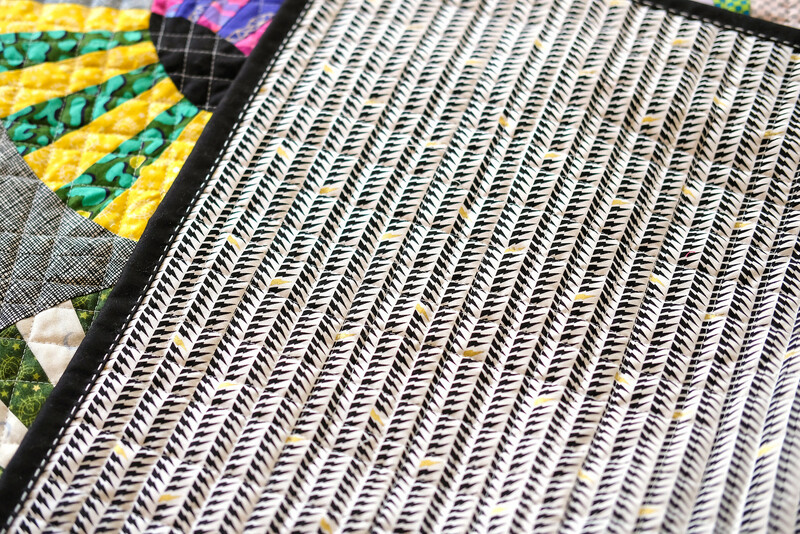 The binding is a black solid and was sewn on with my normal big stitch method. 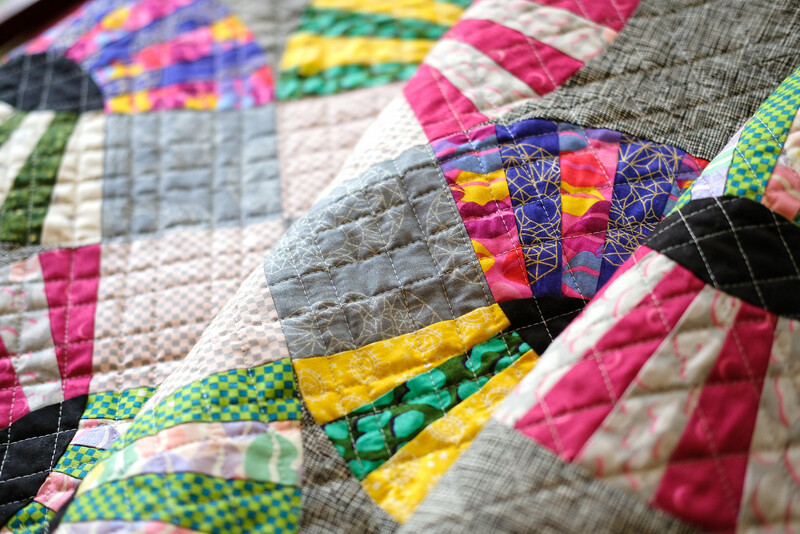 I have a nice little stack of scraps leftover from this quilt and I would love to share them with you - if you would like to enter to win them, leave a comment on this post letting me know what I should add to my quilting bucket list! I will pick a winner on Sunday. The winner of the giveaway is Joyce Carter! Fabrics: Wildside by Libs Elliott from the December Culcita Box. Is the Pickle Dish on your bucket list? Pick up the book so you can make your own! I would suggest you add a New York Beauty quilt to your "bucket list" of quilts to make one day! I've just finished one, with the help of my bee buddies and I absolutely love it! Good luck deciding on what you'll put on your list! Your pickledish is fabulous! What a wonderful quilt! I would for sure not be ready for this level of quilting ! A quilt that might be fun to try would be a Mariner's Compass pattern. 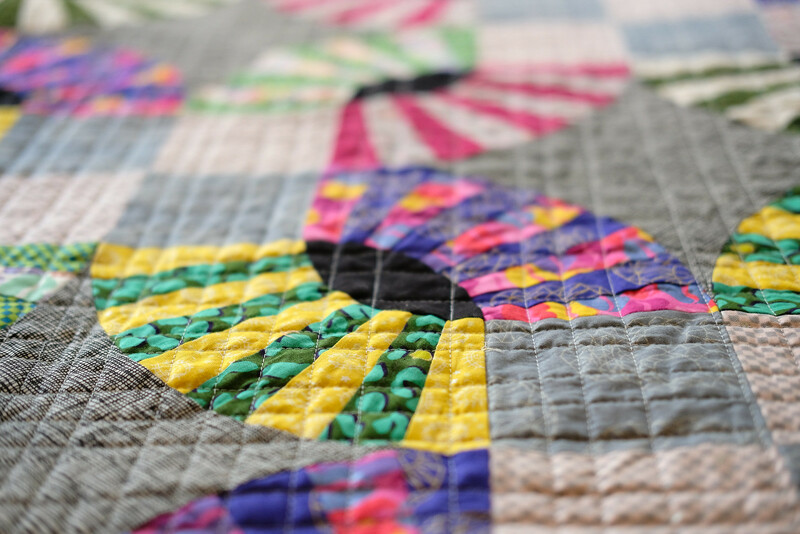 I would definitely agree with Patchwork and Play (comment #1) that a New York Beauty quilt is in your quilting future! I have made it, and while challenging, the results are spectacular. Wow, your bucket list is challenging. For me, I would like to make a grandmother’s flower garden quilt. How does that sound? Ooh, i like the mariners star or new york beauties idea. I'll second those. Add this pickle dish quilt is BEAUTIFUL! If you haven't made one yet, I would suggest adding a lone star quilt (or at least a big block) to the list. It is a great way to learn about bias edges and set in pieces. I love your Pickle Dish quilt! You did such a nice job in you choice of fabric, quilting, and backing. I, too, vote for a New York Beauty quilt. Congrats on a wonderful finish! And thanks for the big stitch binding idea I will have to try. I've made a couple of different versions of Pickle Dish but have to agree that the Kaffe pattern makes it easy. I have lots of really old blocks for FW made too and just recently decided I was not going to make any blocks that require pp but may make some substitute blocks. Plus I think I have decided to use an alternate chain block to tie it all together. And as to addition to bucket list - Jack's Chain? Feathered Star? Beautiful! As for the bucket list, what about a travel component? I have in mind a few quilt shops I would like to visit in person, along with the goal of participating in a quilting retreat some day! Beautiful quilt! You did a fantastic job especially with all the curves. I have a bucket list that seems to be getting longer. One of the quilts that I want to make is Grandmothers' Fan. You might like to make that one also. Thank you for the giveaway. Love this quilt! I am putting it on my bucket list. I just finished a Storm at Sea quilt and think it is bucket list worthy. Dresdens. Pickle dish IS on my bucket list. I even have a very old pattern with papers included. I agree with some of the others, A New York Beauty. As you are so skilled, I would think the New York Beauty would be amazing. I love all the ones I have seen of the New York Beauty. What about adding a portrait quilt of some kind? I love it! A pickle dish is definitely on MY bucket list, though who knows when that will happen. I think you should add Dresden plates. They look great with so many different fabrics. I think you should add whatever makes your heart sing. What a beautiful quilt! At first I thought it was made with the quick curve ruler. 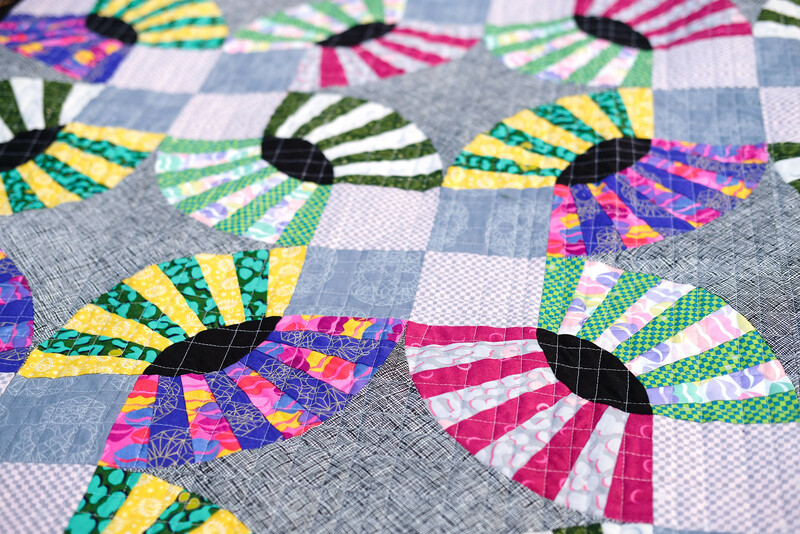 How about a kaleidoscope quilt? I have more of a wish list than a bucket list. The things I'd like to make, although a few are challenging. The comments above about a New York Beauty are good, but what about something that is a different style of quilt... a medallion quilt. I designed and made one last year and getting each round of borders on is a graduate level course in art/math/geometry. But very satisfying. How about design your own quilt rather than follow a pattern or make a known kind of patchwork. I've done that, and I am certainly not as accomplished as you are! Quilting bucket list...I love Spools! How about a "Pineapple" quilt! It could use lots of bright colors!! Lots of those are on my list, too! I also have: spiderweb (but you've done an amazing one already! ), pineapple, bear paw. What about a medallion quilt? I just might be the only quilter alive that hasn't made a Dresden Plate of any kind, but if you haven't yet either, I'd suggest one! I also love any type of modern, improv design. I do admire your awesome use of color! 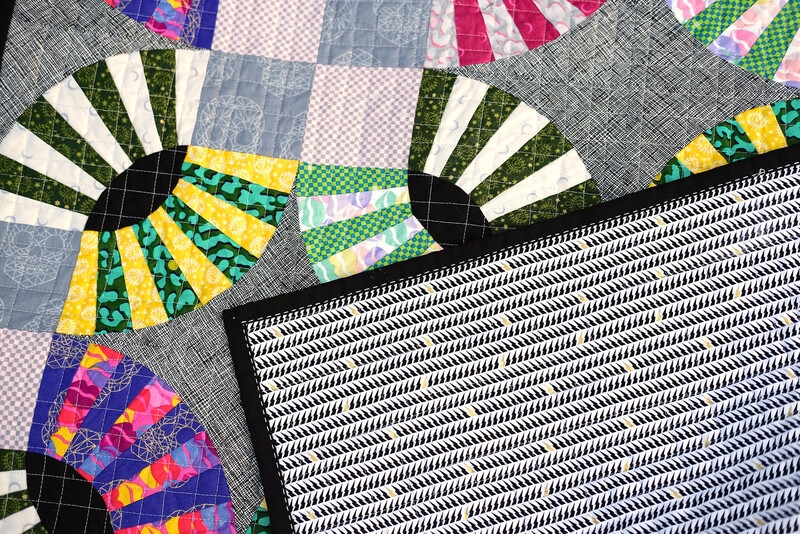 A modern quilt of your own design would challenge your creativity. An original. Wonderful quilt and I love your colors. Lets see if you haven't done a Twisted Log Cabin quilt do that next. I love mine. So nice. I love it. 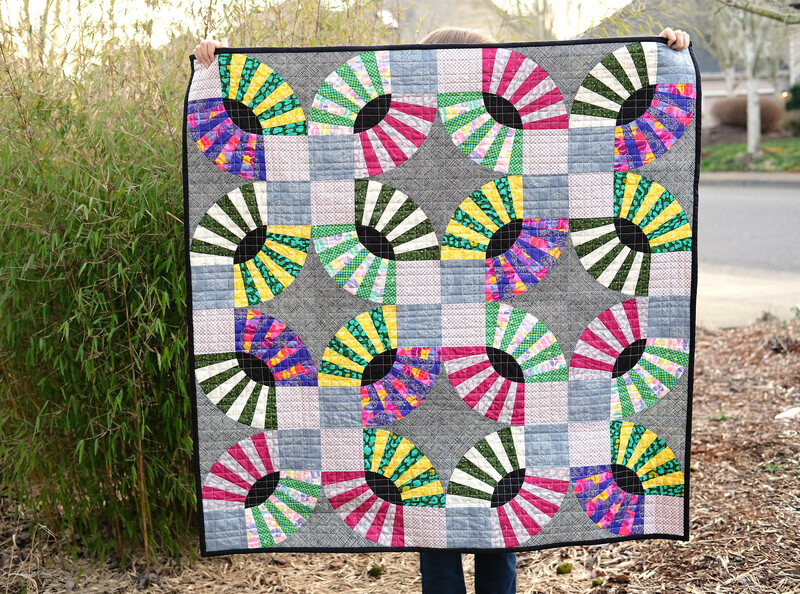 How about a Jen Kingwell quilt? I don't have a bucket list, but seeing yours makes me want to start one. WIth all of those under your belt I think you are ready to design your own quilt pattern and add that to your bucket list! I am new to quilting and haven’t made any of the ones on your bucket list, but your choice of fabrics inspires me to make this one! How about adding a Storm at Sea.......I have seen so many beautiful versions. Definitely on my bucket list. I would suggest a mariners star. I've always loved Pickle Dish quilts and it's on my bucket list too. I would suggest a Dresden Plate or like some suggested, New York Beauty. I truly want to make a Mariner's Compass. O the temptation! You could join me! I don't know what you are adding to yours, but I will be adding Pickle Dish to mine!! Beautiful. Thanks for the tip on paper piecing. Pickle Dish is awesome! There are so many wonderful patterns and block of the months available. For a scrappy idea, and a great scrap buster, how about the Scrappy Trip Around the World free pattern on Bonnie Hunter's website. How about adding a lone start quilt? They are so pretty. I meant a Mariners Compass. Too early in the morning to think straight!